1: Department of Biology of Organisms and Systems, University of Oviedo, Oviedo, Spain. 2: Research Unit of Biodiversity, Unidad Mixta de Investigación para la Biodivesidad, Consejo Superior de Investigaciones Científicas, University of Oviedo, Principado de Asturias, Oviedo, Spain. 3: Department of Agro-forestry, University of Valladolid, Vallodolid, Spain. 4: Institute of Biology, University of Neuchâtel, Neuchâtel, Switzerland. 5: Sustainable Forest Management Research Institute, Palencia, Spain. Avian brood parasites lay eggs in the nests of other birds, which raise the unrelated chicks and typically suffer partial or complete loss of their own brood. However, carrion crows (Corvus corone corone) can benefit from parasitism by the great spotted cuckoo (Clamator glandarius). Parasitized nests have lower rates of predation-induced failure due to production of a repellent secretion by cuckoo chicks, but among nests that are successful, those with cuckoo chicks fledge fewer crows. The outcome of these counterbalancing effects fluctuates between parasitism and mutualism each season, depending on the intensity of predation pressure. The authors investigated (i) whether the great spotted cuckoo provides a benefit to crows and whether such benefit could derive from the ability of cuckoo chicks to deter predators with a noxious secretion that they release when harassed, and (ii) whether the outcome of host-parasite interaction varies across seasons, depending on the intensity of predator pressure. experiment they moved one crow chick between synchronous nonparasitized nests and kept unmanipulated nests for control. Finally, they used gas chromatography and mass spectrometry to analyze the chemical composition of cuckoo cloacal secretions, and performed repellence tests on species belonging to the three main groups of crow nest predators (mammals, corvids, and raptors). Seventeen quasi-feral cats were each presented with 10 pieces of chicken meat, treated either with water or natural cuckoo secretion. Seven captive crows and seven captive raptors were each offered six pieces of meat (three treated and three control), one at a time. Fig. 1. Probability of success of experimental and control nests: shows an increase.in success with cuckoo added. Overall, throughout the 16 seasons, parasitized and nonparasitized broods did not significantly differ in the number of crows fledged, though results suggest a slight benefit from raising a cuckoo. The results of the translocation experiment show a causal link between the presence of a parasitic chick and greater nest success. 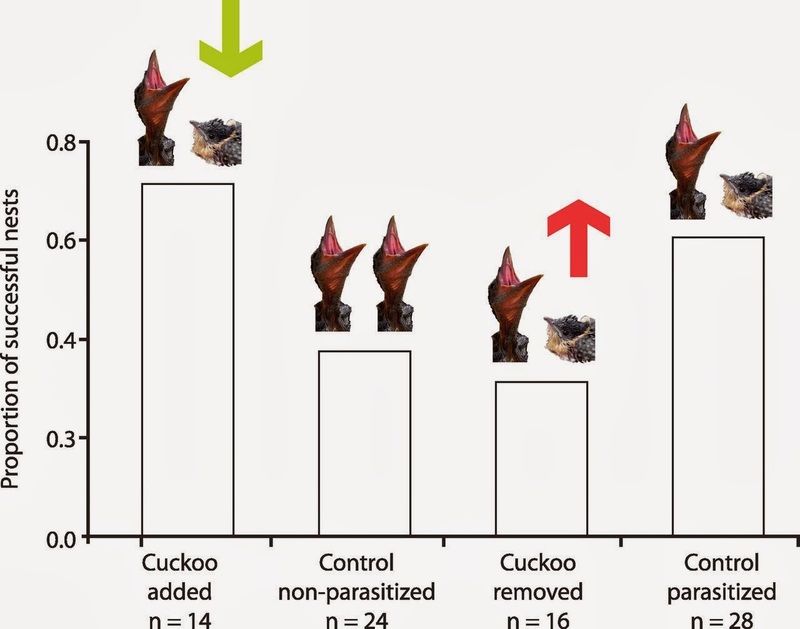 Among parasitized nests, those from which cuckoos were removed failed significantly more often than control nests, whereas among non-parasitized nests, the addition of cuckoo chicks resulted in significantly increased success (Fig. 1). In sharp contrast to the effect of cuckoo chick transfer, nests in which a crow chick was added showed no difference in success rate from those that were not manipulated or those from which a crow chick was removed, though the difference was suggestive of a reduction. The most plausible mechanism driving the reduction of failure in nests with cuckoos is predator repellence by a malodorous cloacal secretion that parasitic chicks void when grabbed. This secretion is only produced by cuckoo nestlings (0 of 23 captured adults showed it) and can be copious (up to 1.2ml released by a 45g chick). The chemical analysis of cuckoo secretion revealed a mix of caustic and repulsive compounds, dominated by acids, indoles, phenols, and several sulfur containing compounds that are known to repel mammals and birds. Further chemical analyses confirmed the distinct volatile profile of a cuckoo’s secretion as compared with feces of both cuckoos and crows, and its defensive function was confirmed by repellence tests. Eight of nine cats ate all 10 pieces of control meat, whereas only one of eight cats took a bite from treated meat. When we reversed the treatment for 9 of the original 17 cats, those offered control meat (n = 5) ate all the pieces, but none bit the treated meat (n = 4). Crows also showed avoidance of the treated meat as did the raptors. The authors demonstrate that the consequences of brood parasitism can be beneficial and that this benefit may be context-dependent, possibly preventing the evolution of host defenses, particularly when a nonevicting cuckoo parasitizes a larger host.